Poli is a very popular, traditional sweet flat bread prepared during special occasions and festivals. 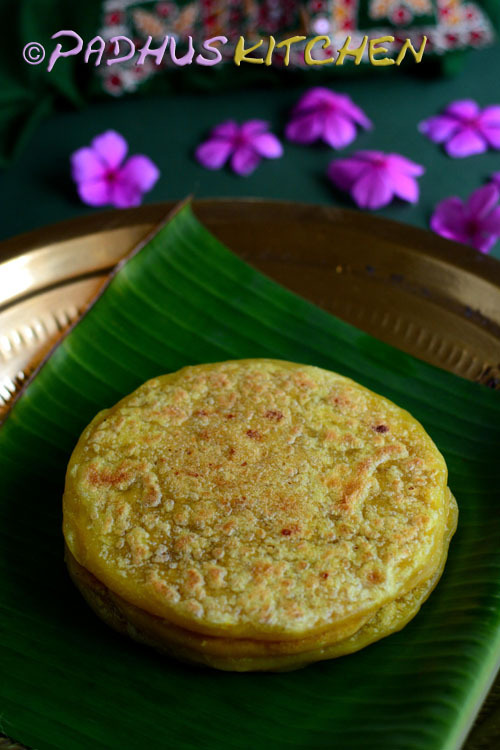 It is known as bobbatlu in Telugu, obbattu, holige in Kannada, puran poli in Marathi and boli in Tamil and Malayalam. There are many variation of this recipe. I have used bengal gram dal and coconut to make this boli. Though it seems a time consuming process, it is very easy to prepare. It is prepared commonly during many festivals like Bhogi, Ugadi, Pongal etc. It can also be had as a snack. Some love to have it pal payasam. Today we will learn how to make Puran poli/boli following this easy recipe with step wise pictures. Made a soft dough by mixing flour, turmeric powder and needed water. Knead it, add 2 tbsp oil and keep it covered for 3-4 hours. Let it remain soaked in oil. The more it remains soaked in oil the more softer the boli will be. It must be soaked in oil atleast for a minimum of 1 hour, if 3-4 hours is not possible. Wash and soak bengal gram (kadalai paruppu) for half an hour. Pressure cook bengal gram dal with water (add enough water to cover the dal) for 2 whistles or until soft but not mushy. You can also cook in a pan. In a bowl, add grated jaggery and just enough water to soak the jaggery. Cook on low heat until the jaggery dissolves. Once it dissolves, filter it to remove dust and impurities if any. Drain off excess water from the bengal gram dal (channa dal). In a pan, add the filtered jaggery water, cooked bengal gram dal, grated coconut and a tsp of ghee. Cook on medium heat stirring continuously until it leaves the sides of the pan. After 3 - 4 hours - Take the maida dough which we kept aside and knead it well again. Now both the dough and the stuffing for poli are ready, we will start making poli. Divide the stuffing into gooseberry sized balls. Grease a plantain leaf with oil. Take a small ball of dough and place it on the plantain leaf. Grease your fingers with oil and flatten the dough with your fingers to form a small circle as shown below. Place a small ball of poli stuffing at the center and seal it on all sides forming a small ball. Now flatten the ball with the stuffing inside to form a thin small circle. Grease the tawa slightly with ghee and heat it. Now invert the plantain leaf with the poli over the tawa as seen in the picture below. After a few seconds, gently remove the plantain leaf. Now cook the poli both the sides until golden brown on very low heat. Once cooked, apply ghee all over the surface and remove from heat. Now puran poli is ready to be served. Enjoy it warm. You can fold it and store it in a container, if not having it immediately. Poli tastes good even after few hours of preparation. For those who cannot get plantain leaf, poli can be rolled out just like roti using rice flour for dusting. In case, if you are using plastic sheet, then transfer the poli to your hands and then place it on the hot tawa. If you are busy, you can make the stuffing the previous day and refrigerate it. Bring it to room temperature before making polis. You can make the dough also in the morning, if you want to make polis in the evening. You do not have to refrigerate the dough. If you have left over stuffing (poornam), dip it in dosa batter and deep fry to make sukhiyan/suyam. Storage and Shelf life - Store it in a stainless steel box. Stays good at room temperature for 1 1/2 days. nice step by step recipe. looks wonderful! I have never made this myself, but have eaten them in friends place this looks so so yumm. Love the step byt step pics too. Hi. Nice step by step narration. We too make puran poli but in a different way, will surely post it some day. Very nice tutorial. This looks very interesting to try. I just love poli....but haven't tried at home....thanks for the step by step recipe...will try it now. You made it look a lot easier with the step by step and they look yummy! wow..step by step instroctions make it so easy to fallow..delicious poli dear. Puran Poli !!! wow !! hats off to you .. thanks for wonderful step by step snaps ! wow super. hai padhma please send parcel me. pls send 10 polies for me alone. nice presentation and yummy poli...tempting pics! My fav poli, even my mom makes same way Padhu. We also use coconut stuffing, but i prefer Bengal gram stuffing. Nice step by step explanation dear!!! wow! !Puran poli!!! such a wonderful festive food..and your explanation and pics r too gud!! I've never had this dish before - it looks delicious. We call this puran puri in gujarati, Its alovely recipe and very delicious.Your step by step pictures are very helpful. Thanks for dropping by my blog. Puran poli looks delicious. And great step by step pics. This is one of my fav..u just brought back old memories,,my mom used to make it often..i have one waiting in my draft folder..
My hub's all time fav food..Looks so nice and yummy dear. Oh! That looks absolutely amazing! I love the step by step instruction, you make it easier to understand. You did such a great job on this post! Way to go, Padhu! I appreciate for your wonderful presentation. Puran poli looks delicious and yummy. Lovely poli with a step by step demo.You can visit my blog and give ur comments. Thats a new method for me...I never knew the Banana leaf method...Puran poli is my Hubby's fav. nice poli recipe..and also its always nice to see step by step pics..
wow, this looks so cool, WIll try it for sure. Shall I save tis lik other sweets? Or Howlong can I keep this? Wat can i use instead of banana leaf? I'm in USA .. I dont find it here ..
You can use a zip lock bag. Grease a plastic sheet or zip lock bag with oil and flatten the poli with your hands. After flattening the poli, gently transfer it to your hand and then place it on the tawa. I tried your poli recipe today, it was delicious but it was little hard. I dont know what mistake I made .., could you tell me and i will rectify it? The dough should rest for a minimum of 3-4 hours. The more time it remains soaked in oil, the more softer the poli will be. Can we prepare the dough and stuffing previous night..next day morning can we prepare poli. Yes, you can Deepthi. Usually I make the dough in the morning around 10 and prepare poli around 3 pm in the evening. It turns out very soft and delicious. As you want to store it overnight, keep it in the fridge. Bring it to room temperature before preparing. For this bhogi going to do boli. Thank you mam. Hi Padhu.I am working and leave home 6am. Can I prepare the dough in the morning to prepare in the evening at 5pm? If I do that should I refrigerate it? Or if I prepare at night can I make it next day evening? You can prepare the dough in the morning and make poli in the evening. Yes, you have to refrigerate the dough,if it is more than 5-6 hours. Bring it to room temperature before making polis. Hi Padhu... I tried this recipe yest... I overcooked the dhall so that it became a mashy paste on mixing with jaggery😦 can we use it as such? Or is there a way to correct this? If it is mushy, you can do one thing. Add a tsp of ghee and cook it along with the jaggery until it thickens. Then cool it and use it. If it is watery, you cannot do anything. Can we use wheat or millet flour instead of maida flour? Also while baking cookies and cake is there any substitute for baking powder? Thank you for trying many of my recipes. You can use wheat flour or millet flour but that will alter the taste of the boli/poli. As baking powder acts as a leavening agent,I don't think there is a substitute for baking powder other than baking soda. 1. The dough should sit for 4-5 hours. The more it soaks in oil, the softer the poli/boli. 2. You should add the needed oil. 3. You should make thin bolis and not thick. I tried your poli recipe today, it was delicious. My hubby and kids enjoyed. Thank you so much for your wonderful recipe. God bless you and your family. Hi, tried making your pura poli!!! The only modification was I added a lil extra coconut cos I love the crunchiness and flavor it adds. It was incredible! Thank you so much!!! Happy bhogi and pongal!!!! For making the bolis softer heat oil in the kadai and add it to the flour before kneading it. and knead the flour. The bolis will become softer. Followed your recipe to the dot and it tasted awesome. Thanks for the recipe. Happy Pongal.